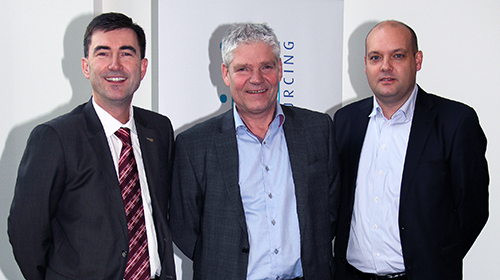 FROM LEFT: Jonny Rydningen, Business Development Manager, Capgemini, Thor-Erik Næss, CEO, Aidon in Norway, and Ronny Brudeseth, Business Unit Director, Power Distribution, Eltel Networks. On Monday, 24th November, two Norwegian energy utilities, Klepp Energi and Jæren Everk signed a contract for procurement of a turnkey AMI solution. Capgemini as the turnkey supplier has the overall responsibility for the delivery, while Eltel is responsible for booking and installation. Aidon delivers the total AMI technology. The so-called Smart Power project is an important part of the grid renewal of the two companies, based in the south-western part of Norway. – The solution with Aidon technology was the most innovative and future focused alternative. Aidon meters will give us the most flexibility. Especially the possibility to use multiple communication technologies is important for us, says CEO of Klepp Energi, Håkon Ådland. 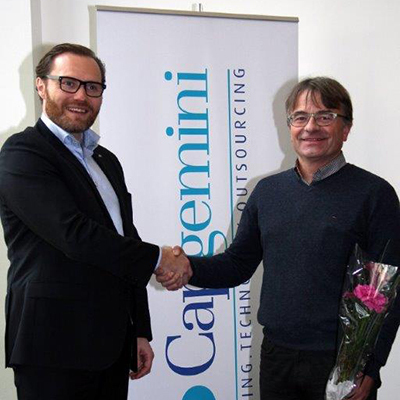 From left: Jens Middborg, Regional Director, Capgemini and Håkon Ådland, CEO, Klepp Energi. – The important thing is not what we are doing today, but what the meters will be capable of doing in ten or twenty years’ perspective. – Automatic metering, grid monitoring, new possibilities for the customers based on the new data – these alone are very important. But I think the main benefits gained from the new system are the ones we do not see today – those that we have not tested yet, says Ådland. The turnkey solution the two TSOs have acquired comprises approximately 17 000 network customers and for Klepp and Jæren it is important to ensure that customers get a good and efficient process when the meters will be replaced. The main reason for the cooperation between them, however, has been to discuss and evaluate the offering together to find the best product, says Ådland. The parties have a clear schedule to adhere to. In Hå and Klepp, the first meters will be put into regular operation by 1 November 2015 and all customers should have the new meter installed by the end of 2017. Aidon is looking forward to the project. – Klepp and Jæren want a future-oriented solution with advanced functionality for AMI, and that is what they will get, says Thor-Erik Næss, CEO of Aidon Norway. – Cooperation is essential for the project’s success and customer satisfaction. Aidon has worked with Eltel and Capgemini earlier, and we feel confident that the parties will cooperate well in this project for the benefit of Klepp and Jæren, Næss says.